Exceptional Odor Control: Amagabeli Air Flow Carbon Fliter can effectively eliminate odors, filter particulates and purify the air to provide both you and your plants with clean and fresh environment. 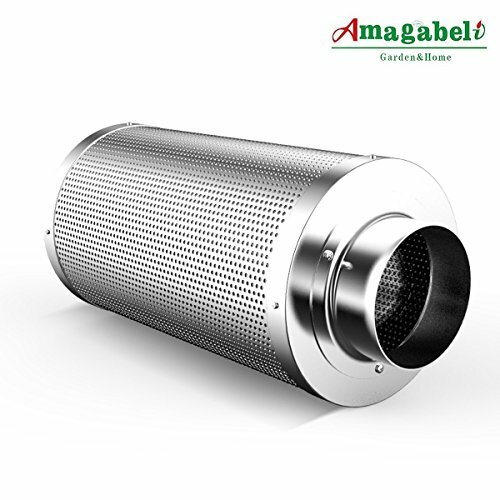 Professional Grade: Amagabeli filter contains very special virgin carbons that come from some of the oldest, most pressurized sources on earth which have exceptional odor control and make air fresh. Environment Friendly: Not only will you keep your space smelling clean and fresh, but Amagabeli’s carbon filters also eliminate additional harmful and potentially ill-fating chemicals from the air you breathe. The haul of illegal weapons seized in Australia in Gold Coast City, also contain 3D-printed weapons, as reported by BBC. The police said that this is the first-time firearm components made of 3D-print have been discovered. The raid uncovered plastic knuckle dusters that are believed to be printed gun parts. Australian authorities have already publicized a series of videos that highlight the risks of using 3D-printed guns. The ballistic experts still have to give their reports, but the police can identify most of the major components of the weapons that are 3D-printed parts. To the police service’s ballistics experts, these are complete weapons that just need assembly. According to CNET, the Detective Inspector of Queensland’s Major and Organized Crime Squad said that there were eight parts per weapon and were sufficient to make concealable firearms. These parts have been created on a 3D printer that was meant for commercial business. The 28 year old man with the printer is set to appear in court and has been charged with offences related to drugs and weapons. However, the owner of the printer is not believed to be involved as he had given the machine to the suspect for calibration. He never thought that it is going to be misused. As reported by Dezeen, a police probing a property in Greater Manchester England in 2013, had suspected that they had come across 3D-printed gun parts, but later, it turned out that they were just upgrade parts for the printer that were harmless. There were open-source kits released in 2012 for building 3D-printed weapons by the gun enthusiasts, but at request of the US government, the blueprints were taken offline. The first 3D printed gun was tried in 2013 by the German police, who was testing the plastic weapons for potential use. These incidents show that there is a need to change the country’s laws related to gun-related violence because of the new technologies. XYZprinting announces the launch of a new range of affordable dual colour 3D printers in Australia. Manufactured by XYZprinting, the manufacturer of the world’s most affordable professional grade 3D printers, the new da Vinci 2.0 Duo is Australia’s first dual colour 3D printer under $1,000, and follows the success of the award-winning da Vinci 1.0. According to Wohlers Associates, Inc., the 3D printing market is expected to reach $21 billion by 2020; XYZprinting is opening the door for mainstream adoption of 3D printers with its pricing model – at $999, da Vinci 2.0 Duo is 50 percent less than the nearest competitor product. Bringing a new level of usability and affordability to 3D printing to appeal broadly to consumers, entrepreneurs and the SMB segment, the new da Vinci 2.0 Duo 3D printers are now on display and available for order through XYZprinting premium resellers. Key features of the da Vinci 2.0 Duo 3D colour printers include ease of use with no assembly required; safe and simple filament cartridge loading; dual nozzle, dual colour ideal for printing two-colour projects; large build volume of 5.9″ W x 7.8″ H x 7.8″ D (15 x 20 x 20cm); resolution modes ranging from fine print at 100 microns to 400 microns; alerts and functions provided for a low maintenance experience, including print-bed auto detection, low filament alert, auto nozzle cleaning and heated print bed for easy product removal; 1000+ designs cloud-sourced from the community through the XYZ Design Gallery; compatibility with Windows and Mac operating systems; and limited one-year warranty. Simon Shen, CEO of XYZprinting explains that their strong roots in manufacturing have allowed them to bring efficiencies to the design and manufacturing of the da Vinci 3D printer line, which are now being passed on to their customers through affordable pricing. He adds that their goal is to provide world-class 3D printing models that allow for widespread adoption to drive the market, and innovation in the market, forward. XYZprinting’s da Vinci 1.0, a single nozzle 3D printer available for $749, won a CES 2014 Editor’s Choice Award and quickly became the top selling 3D printer on Amazon in the U.S., U.K. and Japan.